Welcome to My OWOH Post! Interested In Fashion? Coco Chanel? Giveaways? I laugh whenever I see this pic. Just taking a break from finishing my OWOH pieces (one is for the ADO blog giveaway) and was going through some of the pics in my files. Wanted to share a giggle with you all! Don't you just love the extreme feeling this little 'angel' puts into the face! Hope everyone has a most fabulous weekend! Hello Sue! I'm still working on OWOH also! Haha, where do you FIND these pics?! I'm pea-green that you found that pic before I did! LOL It's terrific!!! I just finished my OWOH post and scheduled it for publishing. I can't wait to see what you're offering. Ha Ha, neither one of these little darlings look happy! I missed the fun of all this but have pictures of my Mom and her's..
Oh funny, my word verification is...stickupa! Hi Sue, what a great photo. 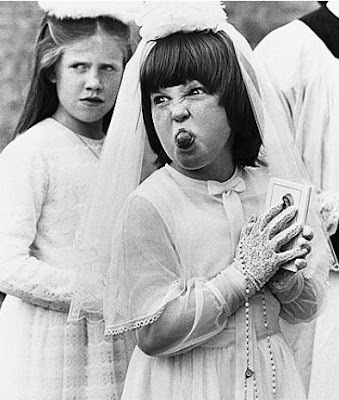 Brings back memories of my own confirmation - I was so angelic in my all whites as well. L.
LOL Sue, whats the bet that face is being pulled at a boy ! Love it and am so excited for the OWOH and hoping I win from everyone. Thanks for your feedback on my post. It is nice to know that you like the images as they are. I think they are pretty powerful as is and have no intention of changing them and appreciate your vote of confidence. The littlest angel made me chuckle! I wonder who she was sticking her tongue out at! !